Bollywood Superstar famously known as Mr Perfect Aamir Khan has shown his appreciation for Pakistan Tehreek Insaf Chief and former Cricketer Imran Khan. PTI Chairman Imran Khan is in India these days along with some other former Pakistani players like Waqar Younis, Wasim Akram and Zaheer Abbas. Recently these players where present in a ceremony with former Indian Players. Bollywood Star Aamir Khan was also present at that ceremony. In Ceremony Imran Khan answered various questions about his politics. Aamir Khan appreciated Imran Khan and said you are a honest man and you are doing great work for Pakistan. Aamir Khan also hoped that Imran Khan will win next elections in Pakistan and that will be good for both Pakistan and India. 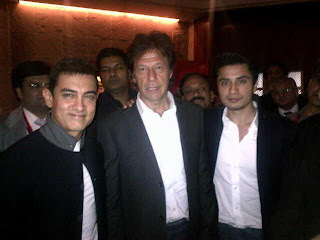 Aamir also promised to come Pakistan to congratulate Imran after he will win the 2013 elections. Aamir Khan also came to Pakistan few years back for a campaign against cancer on invitation of Imran Khan.